Noreen Martin has demonstrated significant dedication to the well-being of the San Luis Obispo community through her business leadership and philanthropic efforts. Her leadership and business intuition successfully propelled her company, Martin Resorts, to become one of the top private, female owned employers in the country. Fueled by her passion for supporting tourism and the local economy, she assisted in the creation of the first Countywide Tourism Marketing District and she now serves on the official State of California tourism board. In addition to her business success, Noreen is devoted to numerous causes, dedicating time and philanthropic resources to local non-profit organizations. 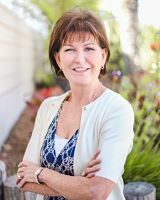 She serves on the Hearst Cancer Resource Center Advisory Committee for French Hospital Medical Center and has also been involved with Paso Robles Children’s Museum, Visit San Luis Obispo County, and is a judge appointed CASA Advocate. She was previously the recipient of the 2009 Champions for Children Award. Additionally, she has generously donated her Chianti Farmhouse/Villa as an auction item to numerous local non-profits, raising tens of thousands of dollars to support many local charities over the years. Noreen is an extraordinary leader and advocate for our community whose contributions will last for years to come. Noreen will be presented with the 2017 Humanitarian Award on August 19, 2017 at the Celebration of Caring Gala. To congratulate Noreen, you may place a tribute message in the gala program. For more information, contact us.